WHEATLAND, Mo. 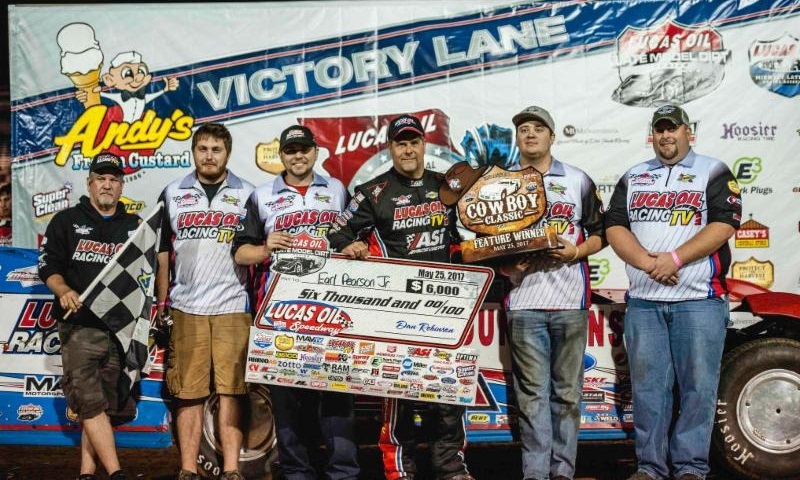 — Earl Pearson Jr. took the lead from Jesse Stovall on lap 15 and then held off Scott Bloomquist in the final laps to win Thursday’s Cowboy Classic presented by Hot Rod Processing at Lucas Oil Speedway. The event was co-sanctioned by the Lucas Oil Late Model Dirt Series and Lucas Oil Midwest Late Model Racing Association. Pearson kicked off the 25th annual Show-Me 100 weekend with his second series win of the season over Bloomquist, Jimmy Owens, Tim McCreadie and Mike Marlar. It was a very competitive race from start to finish, as Pearson withstood a lap 39 restart challenge from Bloomquist, who had pulled even with Pearson several times in the final six laps but could never clear him. Pearson admitted that the late-race yellow was the last thing he wanted to have happen. Bloomquist who started on the pole, finished second in his Crop Production Services/Reece Monument Company/Mark Martin Automotive-sponsored Sweet-Bloomquist entry. Owens was in the hunt late, before finishing in third place. Feature (45 laps): 1. Earl Pearson Jr., 2. Scott Bloomquist, 3. Jimmy Owens, 4. Tim McCreadie, 5. Mike Marlar, 6. Darrell Lanigan, 7. Bobby Pierce, 8. Gregg Satterlee, 9. Mason Zeigler, 10. Billy Moyer Jr., 11. Payton Looney, 12. Logan Martin, 13. Dave Eckrich, 14. Rodney Sanders, 15. Billy Moyer, 16. Steve Francis, 17. Chris Simpson, 18. Tony Jackson Jr., 19. Chase Junghans, 20. Don O’Neal, 21. Tim Manville, 22. Dennis Erb Jr., 23. Jesse Stovall, 24. Jason Rauen.